You may have already heard our news, but because the Humpbacks have started migrating big time back to Alaska, we’re cutting our Whale Watch Season short by 2 weeks…so our last official Whale Watch Cruise this season will be on Saturday, March 31st. Yes, we’re still seeing a few Humpbacks, but we just didn’t think we could provide fantastic Whale Watch experiences through the second week of April this year, and that’s why we made the decision. Saying that, we did have some fun Whale Watch Cruises this past weekend. Guests on Friday’s Wake up with the Whales Cruise got to know a lone Humpback pretty well. We found him towards the beginning of our cruise, and at first he was surfacing, spouting a few times, and then diving for 18 minutes. But we stayed with him, and his dive times got shorter and shorter…and he kept surfacing closer and closer to our idling boat. One time he surprised us from 50 yards away, and another time from just 25 yards away. But the biggest surprise from him happened when he breached just 60 yards from us. Some of us were looking the right direction to see the entire breach, but ALL of us got to see the resulting splash! After we finished snorkeling on Friday’s Snorkel and Whale Watch Adventure, we dropped the mooring and let a couple of our young guests take the helm (under our guidance, of course). I guess it’s true that keiki bring us luck, because these two young captains steered us right towards some breaching whales. The whales dove about 500 yards away from us, so we took the helm back, and stopped where we thought they’d surface. Much to our surprise, two whales surfaced at our 9:00 about a hundred yards from us (which seemed kind of far for our breachers to have traveled). So, we turned the boat and began to parallel these two…and then our breachers surfaced behind us! So now we were surrounded by 4 Humpbacks….but we stuck with our 9:00 pod, and watched them surface and spout several times. Finally, one of them surfaced just 40 yards off our bow…we never saw the other one again, so that made us wonder whether that final sighting was of a 5th whale…or our whether our second pod split up under water and went their separate ways. On Saturday, we were inundated with rain so we were forced to cancel all of our cruises. But we were back at it on Sunday. On our Signature Whale Watch Cruise, we looked all over the place for whales, but never saw anything, so we called it a “Fluke” and invited everyone on board to join us on another Whale Watch Cruise for FREE!. We also operated a Private Sunset Cruise on Alala from Kawaihae. We left the harbor with, to be completely honest, a low confidence level for whale sightings. After about an hour of travel along the coastline just enjoying the views, much to our surprise, we saw a spout from a lone whale. We got in the position to parallel him, and we cruised with him for awhile. We watched him surface, spout, and sound twice before we had to turn the boat around and head back to Kawaihae. 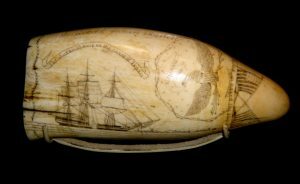 Ocean Sports Whale Fact of the Day: Starting out as a way to pass time between whale sightings and hunts on the whaling ships in the mid 18th century, “scrimshawing” (or the art of carving intricate designs on to whale teeth, bones and baleen) survived until the ban on commercial whaling went into effect. The etched designs were originally produced by sailors using sailing needles, and were colored with candle soot and tobacco juice to bring the designs into view. Today, hobbyists still create scrimshaw — but they use bones and tusks from non-endangered and non-protected animal species like camels, buffalo and even warthogs.